Here is the first video in a small series by oboist Pierre Roy. 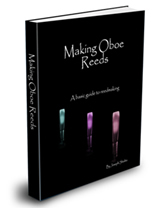 He takes an oboe reed from blank to finished reed in these videos. They are fantastic and I will post all of them up here. Worth the time to watch. Normally I make the oboe reed not in one sitting but in many stages. This helps the cane to adjust and will extend the life of the reed. In doing so, you will be able to make a that is stronger and will last much longer. It will also keep the reed from getting away from you. Reeds change over time and what a great reed needs more than most things is time.